Microsoft CEO Satya Nadella has finally come out and publicly said what we have been reporting for the last couple of months. Things are changing from the Ballmer way. What that exactly means is yet to be determined though as Nadella is also a proponent of Microsoft’s cloud computing initiative: “We live in a mobile-first and cloud-first world”. 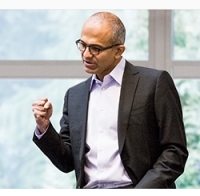 In a memo to all Microsoft employees that is posted on Microsoft’s web site Nadella states that he wants Microsoft to “rediscover our soul – our unique core”. While this is a tad ambiguous it still reflects the potential for Microsoft to get back to what made them a giant in the industry, flexibility. For far too many years Microsoft has presented themselves as the company you go to when you need power and flexibility; “where do you want to go today” was one of their tag lines. Under Steve Ballmer that focus changed to here where we are taking you. We saw this effort in Windows Vista and then again in Windows 8.x as Ballmer tried to turn Microsoft into Apple. So far, we have seen Nadella make some moves to change the direction and path that Ballmer laid out. Of course he is not going to publicly bad mouth Ballmer or his vision of Microsoft. He uses phrases to make it clear that he might not agree with that direction though: “More recently, we have described ourselves as a "devices and services" company. While the devices and services description was helpful in starting our transformation, we now need to hone in on our unique strategy”. Sounds promising right? Well it is in many ways, but there is still going to be an effort to push the cloud computing strategy as well as the “one” OS to cover all devices. Nadella says it clearly, “At our core, Microsoft is the productivity and platform company for the mobile-first and cloud-first world”. The push will be to make an interconnected platform for the world that Nadella describes, but with an unusual focus on the PC power in the home which Nadella describes as almost limitless. So it looks like the focus at Microsoft is going to shift from the Xbox as the center of the digital home back to the PC. The memo could also indicate that Microsoft will shift from using the phone as the basis for the computing experience and change it around with the PC being the base and extending that into the tablet and the phone (which is what people were really asking for). If this is really going to be the focus then Nadella might bring back some of the business that Microsoft lost during the Ballmer years. We will have to see what comes out of Microsoft in the next 6-10 months to be sure that this is really where they want to go today.